Justin Rose has won tournaments on both the European and PGA Tours in 2014. 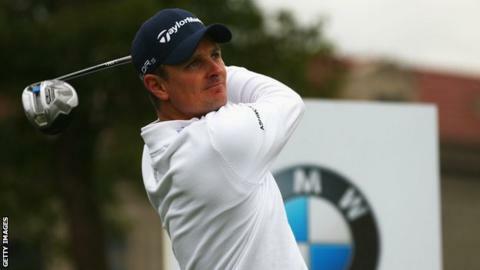 Britain's Justin Rose has set himself a target of becoming world number two by the end of the season. Rose and six of his victorious Europe Ryder Cup team-mates will compete this week at the BMW Masters in China. World number six Rose, 34, hopes to take advantage of the absence of Rory McIlroy and Henrik Stenson to record a victory at Lake Malaren which would lift him up the world rankings. "The aim is to strengthen my world ranking as much as possible," he said. "If I was to play well and win a few tournaments before the end of the season I could get myself to second place in the world rankings, which would be a personal best." The tournament is the first of four in the European Tour's "Final Series" of big-money events in the Race to Dubai, with a prize fund of €5.525m (£4.35m) and a first prize of €920,652 (£725,000). The Final Series also includes next week's World Golf Championships HSBC Champions in Shanghai, the Turkish Airlines Open and the climax to the season, the DP World Tour Championship in Dubai next month. The top three in the Race to Dubai standings are all missing from the BMW Masters line-up in Shanghai. World number one McIlroy, 25, is taking time out to prepare for a multi-million dollar lawsuit with his former management company, and will not play again until the season-ending DP World Tour Championship. Reigning Race to Dubai champion Stenson is on paternity leave after the birth of his third child on Sunday, while world number four Sergio Garcia is in Malaysia this week for the PGA Tour's CIMB Classic. Rose accepts that he has little chance of catching McIlroy in the Race to Dubai. The Northern Irishman, who has won two majors this year, holds a lead of more than three million euros in prize money at the top of the Race to Dubai standings. Rose, a father of two himself, had sympathy for Stenson, 38, after the Swede made the decision to withdraw from the tournament on Sunday. "The six months of fall-out leaving your wife after just having a baby? It's not worth it," Rose said. "He's made the right decision." Rose will be joined at Lake Malaren by six of the Europe team, Graeme McDowell, Victor Dubuisson, Thomas Bjorn, Jamie Donaldson, Stephen Gallacher and Ian Poulter, that beat USA 16½-11½ in the Ryder Cup at Gleneagles in September.